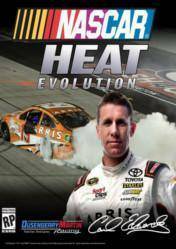 NASCAR Heat Evolution cd key is the digital version of NASCAR Heat Evolution for Steam, in digital serial or Steam Gift format, depending on the store where you buy it. It´s a driving simulation game set in the NASCAR world races, in which we can ride as one of our favorite pilot in NASCAR Sprint Cup Series through 23 official tracks of NASCAR, and all accompanied by stunning and high definition graphics, very detailed and realistic. One of the new additions directly influences the difficulty of racing and the growing improvement of AI, so we have a more competitive and consistent AI with our level. It also offers players the ability to build our own team from cero and prepare them for the Sprint Cup. We have at our disposal different ways, as the championship mode, full of challenges and fun races for fans of nascar. Although it´s not one of the best driving simulation game, it offers hours of frantic racing, good car and team customization, and a multitude of challenges for fans of racing games. There are no comments yet about NASCAR Heat Evolution . You can be the first one! NASCAR Heat 3 - Daytona 500!